Music is one of the most relaxing ways to unwind after a hard day, The June release focuses on musical instruments! 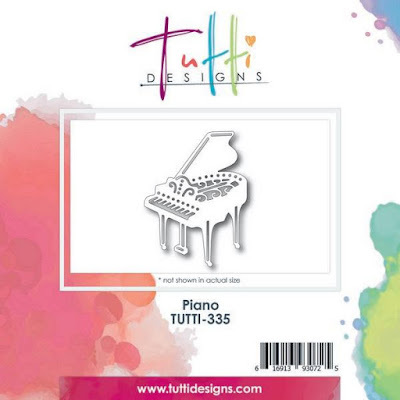 these dies will be some of the most used in your collection because they can be used for recitals, invitations to piano recitals and so much more. Tutti Designs has some of the best dies around so be sure to check them out in the store! To make this I used black card stock for the background and simply adhered it on a gold foiled card stock mat. Tie a ribbon to the top and adhere to your card base. Die cut the piano using black card stock and adhere gold foiled card stock to the back of the harp and cut it out. Cut an oval from glitter card stock using the Stitched Nesting Oval die set by Tutti Designs. Adhere the piano die cut to the card using foam squares to bump it up for dimension. Add some random sequins and your card is finished! That piano die is to die for, I love it! You have put it on display perfectly! Love how you have layered to make all of the little details POP! Fabulous card! You have showcased this piano die beautifully! Love the gold foiling and the pretty sparkle in your oval background panel! Awesome inspiration that sparkle & shines! Thanks!